If it’s isn’t obvious enough, literally every culture has something to celebrate. That’s not all. Apart from eating, drinking and dancing – there are definitely unique ways by which people get their party on. The town of Sur Trie Baise used to have a thriving pig market a long time. While this is also but over in the times we live in, they continue to celebrate this festival with great fervor. This Hindu festival takes place in southern India and is all about body piercings. Probably, a really extreme form as it involves a lot of pain too. In fact, according to its practitioners, the more pain your endure, the blessed you will become. Speaking of extreme, some of them are known to pull tractors or other heavy objects with the hooks in their skin. This festival is in celebration of their New Year which takes place in April. In fact, it is the world’s largest water gun fight that occur throughout the country and not just in some isolated village. In this regard, we’re talking about supersoakers, buckets or even buckets as well. 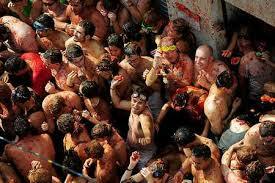 Known as the Fiesta de Santa Marta de Ribarteme, this festival takes place in Spain and in the town of Las Nieves. This is in honor of the Saint Marta de Ribarteme who is the Patron saint of resurrection. What happens during the festival is that people are carried in coffins but they’re dead. Instead, they have had a near death experience and are showing their gratitude.